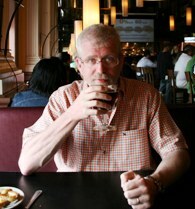 This week on the BeerSmith Blog we feature an interview with fellow beer blogger Al from Hop Talk. Hop Talk is one of the more popular beer blogs on the internet. Hop Talk covers microbrews, the brewing industry and beer news. While Al occasionally touches on home brewing as well, the focus is often on the broader beer industry. Al also recently featured his “beer of the day” blog entry where he drank 365 different beers over the period of a year and blogged about it. We’re happy to feature an interview with Al here today. 1. How did you get started brewing? My buddy Ron (who writes some of the content for Hop Talk) started doing it and it intrigued me. Then my wife got me a brewing kit for my 30th birthday (boy, that was a long time ago) and so I started dabbling in it. I don’t do it often enough to consider myself a homebrewer, though. Fortunately the folks in Frederick’s Original Ale Makers don’t require any sort of minimum output. When I do get to brew, though, I enjoy it. 2. Hop Talk is one of the most popular beer blogs, what made you decide to start it? I could talk for hours about beer. I finally decided that I needed an outlet to express myself. Blogging seemed like the logical thing to do. 3. What kind of stories and posts do you focus on? It varies. While I like the mechanics of brewing, it can get awfully technical and others can discuss it with more knowledge. I like to look at the sociable aspects of beer, at how it can enhance the interactions between two or more people. That said, I’m also interested when some medical study or other determines that some aspect of beer is good (or bad) for you and I’ve become much more interested in the dynamic between “craft” brewers and the big boys. 4. Many bloggers lose motivation after a year or two – how do you maintain focus? Sheer stubbornness? Well, not entirely. For one, I have a supportive spouse who lets me spend a few hours a week drinking and writing about beer. For another, I simply haven’t run out of things to say. Then, of course, I keep seeing my RSS subscriber and Twitter follower numbers keep going up, and that provides further motivation. I mean, these people are taking time to read what it is I’m writing; I don’t want to let them down. 5. Where do you find your best material? Honestly, my best stuff is what comes out of my own head. I’m a voracious reader and I subscribe to more beer blogs than I really should, not to mention the news alerts I’m subscribed to. I find a LOT of good stuff there, of course, and I’m always pleasantly surprised to find something in the mainstream media that sheds a positive light on beer, but if I’m honest with myself my best articles are from a nugget that popped unbidden into my consciousness and wouldn’t leave me alone until I’d written it. Now, if only I could do that at will. 6. The BeerSmith blog is primarily focused on homebrewers. What advice do you have for fellow brewers? Join a homebrewing club! I don’t know that I’ve ever encountered a group of people so entirely knowledgeable on a subject and so friendly at the same time. Collectively, they can seemingly answer any brewing question I might have and have not ever turned their noses up at the output of a simple extract-brewer like me. 7. You posted a “beer a day” in 2009 – tell us about that experience. It was hard! I never, ever, thought in my adult life that I would not look forward to having a beer every day. Then there is the weight I gained. On the plus side, because I needed to have a unique beer every day I had to get out of my comfort zone and try styles and brewers that I’d normally skip. I discovered a few of each that I rather liked. 8. What are some of your favorite posts? The Personal Finance Advice blog posted a “how to save money on beer” article that was obviously written from the perspective of someone who doesn’t care a whit for taste and just wants to save a buck. I posted “Tips for saving on beer” in response. Another one is my riff on “life is a journey not a destination” as it pertains to beer and my maturation as a beer fan “Beer is a journey not a destination“. Then there is “The unofficial Hop Talk beer rating system“. That came about from a rather spirited discussion amongst what I now call “The Hop Talk Advisory Panel”. 9. You wrote a BrewPoll.com plugin for wordpress – how did you jump from blogging to writing plugins? I’m a ColdFusion developer by profession. When the code for adding the BrewPoll vote button came out, I found a plugin that did nearly the same thing and simply modified it with the BrewPoll code. I’m no plugin writer, although it’s something I might explore in the future. 10. Do you have anything else you would like to add? When you get together with your friends, take time to choose a beer appropriate to the location, season, food and activity you’ll be doing. Then, forget about the beer and enjoy the time you spend with your friends. Such moments are all-too-fleeting. Thank you for joining us on the BeerSmith Home Brewing Blog. Be sure to subscribe for regular delivery by mail, and give our software BeerSmith a try if you have not already done so.